Badass Boards: Kaleb’s works of art. An end grain cutting board is the Cadillac of cutting boards. Both functionally and aesthetically, they are tough to beat. Let's talk a little bit about why an end grain board is so special. 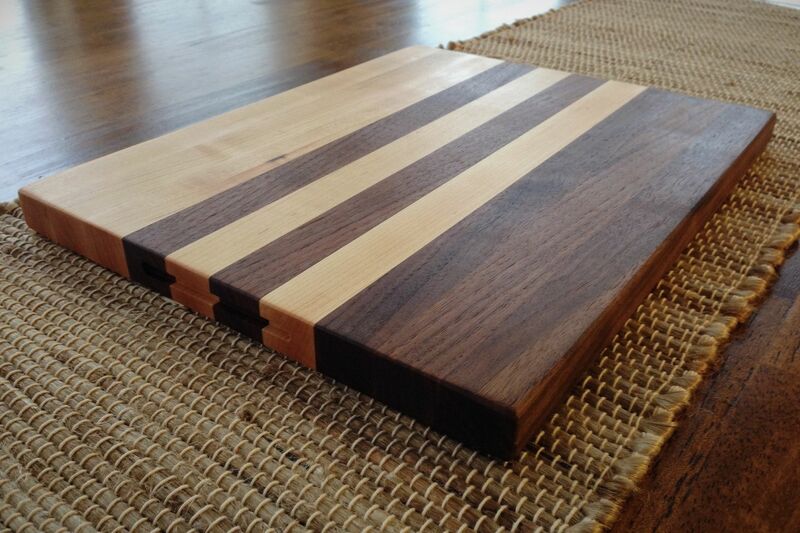 Think of your cutting board like a paint brush with the wood grain being the bristles of the brush. Lay that paint brush horizontally, and you have a long grain cutting board. Your knife is going to rest on top of the bristles. Functional, but quite hard on your knife. Additionally, these are not quite as durable as an end grain board as scratches will add up over time and pieces of wood fiber can even eventually be dislodged. Now take the paint brush and hold it vertically and you have an end grain cutting board. Your knife can slide easily into the bristles. In fact the bristles actually make a cushion for your knife. And after each cut the bristles or wood fibers can spring back into position. Scratches are less likely and less visible and the board itself much more durable. So, if an end grain board is so much better, why don't we see them everywhere? The biggest reason is simply due to the additional work that is involved in making an end grain cutting board, which then makes them quite a bit more expensive. For a long grain board, you can simply glue strips of wood together and voila! However, to expose the end grain, you have to then take the completed board and cut it into strips, flip them on end and glue the whole thing back together before sanding for hours and hours to achieve a flat smooth board. So, if an end grain board is definitely the way to go...are all end grain boards created equal? Certainly not. The biggest thing to look for in selecting your new board is the type of wood. We don't want a soft wood or a wood that has an open or loose grain structure. We also don't want an overly oily wood. We are after a nice hardwood with a dense, closed grain pattern. But some woods have a VERY dense grain structure. So much so that even the end grain is still quite hard on your knives. Imagine our paint brush standing on end but being squeezed so tightly the knife still can't be cushioned because the bristles are so tight. Pine and cedar are cheap and easy to work with, but just too soft and open grained. Teak, ebony, bubinga, acacia, hickory and others will make a stunningly beautiful board, however they are just too densely grained. Cocobolo, goncalo alves, purpleheart and other tropical hardwoods are some of favorite woods for certain projects, but just too oily for a cutting board. My top choice for an end grain board is hard maple, often referred to as rock maple. This is the perfect balance of dense grain, that is hard and durable and actually still quite affordable. Now, some of the most beautiful boards out there combine different lumbers to create spectacular contrasting patterns, so a great choice for secondary woods could be walnut, oak, cherry, or others. I decided to make these for my holiday gifts. They were a lot of work but totally worth it! Check out what I have been up to all year! Utah air is awfully dry and cause wood boards to split and crack. Conditioning the wood will prevent cracking and keep it looking beautiful. A good rule of thumb for treating a new board is to oil once a day for a week, once a week for a month, once a month for a year, and once a year for life. You should also treat wood after washing with heavy soap or anytime the wood looks dry. There are various conditioning oils, creams, waxes and blends available specifically for wood boards. However, the simplest solution is as good as any: mineral oil. Avoid vegetable oils and any others that aren't perpetually stables since they will eventually go rancid and make your board stink. Keep your cutting board on the counter top where it can breath. Avoid storage in places where airflow is stifled and where moisture can get trapped. Always wash your board by hand with soft materials. Only use soap when necessary. Never wash in the dishwasher, and never leave the board to to soak submerged.